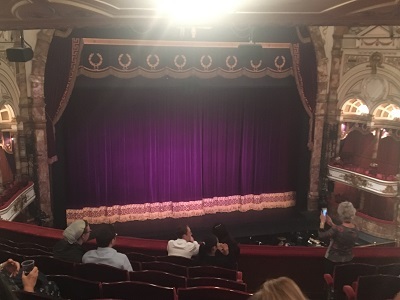 It has been two years since I saw Swan Lake live at the Royal Albert Hall… so it really is about time for me to see another ballet (it’s also high time that I saw another opera, but these things cost money). These tickets were a present for the hub as, apart from a brief version of The Tin Soldier in Tivoli Gardens, Copenhagen, he had never seen a ballet before. Thankfully he really enjoyed it and I think we’ll be seeing some more of these when good (cheaper) tickets are available. With this that’s the third of the three Tchaikovsky ballets done. I’ll probably end up seeing The Nutcracker at some point in the future – even if it is just to complete the trilogy. Of the three ballets, this one was probably the weirdest of the three to listen to (and watch) properly. Why? Well, as with a lot of the classical pieces so far, I know most of this music via Disney. Having grown up with Disney’s Sleeping Beauty on VHS, I am really well acquainted with a lot of Tchaikovsky’s score. The weirdness came not from the difference in the narrative (although that was a bit discombobulating), but the context for the music. For example, in the film there is music that is linked to the princess being hypnotised and, eventually, pricking her finger on the spindle. In the ballet, however, this is a dance done in the final act by two dancers dressed as white cats… who happen to be guests at the wedding. With the two stories being fundamentally different it makes sense that music was being used for different plot beats – although some, like the entrance of the evil faerie, can still be found in remarkably similar contexts. Anyway, the music for The Sleeping Beauty is excellent and, as you would expect for a ballet, so much is gained by having the dancing as a narrative context for the music. I know that with ‘The Dance of the Garlands’ I would have still thought of the iconic ‘Once Upon A Dream’ sequence – which would have still be fun, but also a pity as I would have missed out on the proper storyline. I would honestly like to write more, but it’s getting to 2 am after a long week at work. So I’ll end by saying that I am so glad that I was able to see this live and get the most out of the music. I also loved the idea that the ballet wrote in a dance between Red Riding Hood and the Wolf – such a weird idea to shoehorn this into this ballet, but I’m glad they did.